This new musical is another world premiere at the Stratford Festival and it’s living up to the town’s theatre’s high reputation – not least thanks to the skills of Tom Rooney, who plays Robert Service with all the passion and desperation this character deserves. It’s about Robert W Service, a British bank clerk who by emigrating from his native England to Canada follows his heart and his “wanderlust” he portraits in many poems. Dubbed as the Canadian Kipling in real life, he goes from job to job, closing in to the wide planes of the yukon territory that call to him whenever he’s bound to a desk job to earn some money. He died with 84, famous and hopefully after a happy and fulfilled and successful life as a writer of both poetry and novels, having it make to the Yukon as well as having travelled through America, Canada, even Russia. Our musical starts while he is employed at the Canadian bank of commerce branch in Victoria, British Columbia, – two years before they actually did send him to the Yukon branch. While he is in Victoria though, he writes poems full of longing about the life of a free man, digging gold, being a cowboy. Yet he cannot make up his mind to leave the security of the bank for good: He is in love with his beautiful coworker Luise, even though she is engaged to his boss, aptly named Dan McGrew. Luise is flattered by his attention and encourages his infatuation – dangling the carrot of a life together and casually mentioning a ploy to embezzle money easily from the bank. Robert is too smitten to resist. He takes the money to have a chance of a life of adventure – only to discover that dearest Luise wanted the fortune for herself alone, leaving him with fraud charges at the bank. But then it is she who is duped: as a test Robert had filled a bag with his clothes and not with money, on the contrary, he had returned the embezzled money back into the correct accounts, now able to claim he was just executing a test to prove how easily money would be vanishing. As he attributes the test to his boss Dan McGrew he ensures that McGrew is sent to the Yukon branch to build the new bank there. He, Robert, is going to stay in Victoria. Because only there, the owner of the bank tells him, he could do what he’s best at: to dream. The play itself is moving and the crime plot interesting enough to capture its audience. Unfortunately the music is fun, but not extraordinary even tho they used the ballads “The shooting of Dan McGrew” and “The Cremation of Sam McGee “, both fabulous examples of his poetic skills. Thanks to Tom Rooney, Dan Chameroy as Dan McGrew and Randy Hughson as the bank owner (and the brilliant Lucy Peacock as shady Mrs Munsch) the play is fun to watch and left me with a smile! 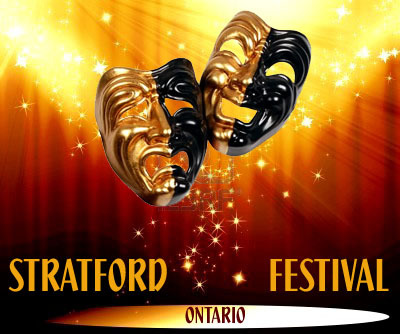 This entry was posted in Stratford Festival Ontario, theatre and tagged Dan Chameroy, Lucy Peacock, poetry, Randy Hughson, Robert W. Service, Stratford Ontario, Stratford Shakespeare Festival, tom rooney. Bookmark the permalink.